I seem to have passed all of these "issues" down to my children as now there is always someone in my household who is sick whether it's a cold or allergies or something else. 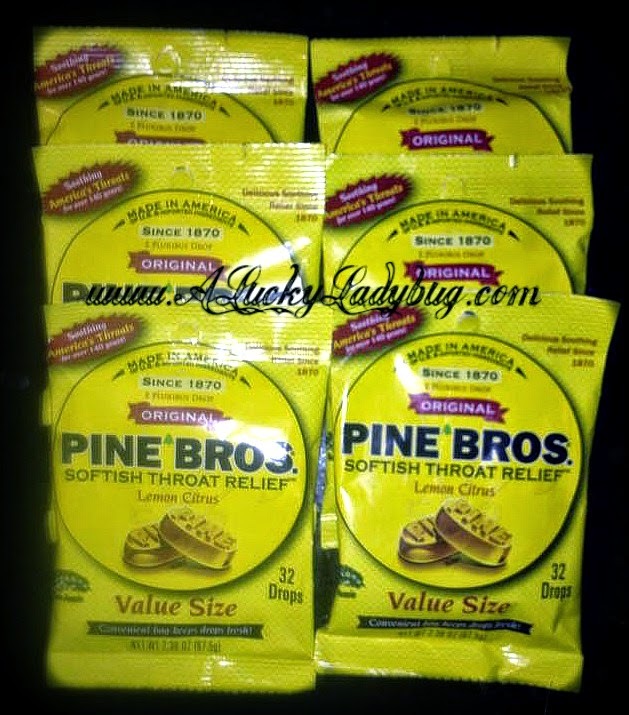 So when the opportunity came available to again review the Pine Bros Cough Drops this year, I was all in! 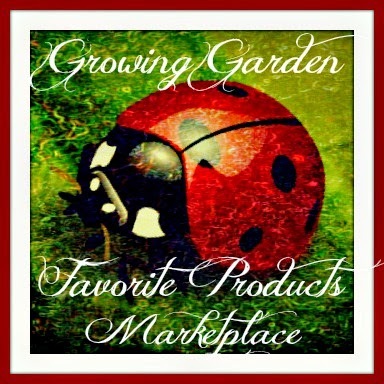 I was sent several packs of the cherry and new lemon citrus flavors as well as in both the to go pucks and the normal bags. The cherry had a nice subtle flavor and the piece slowly dissolved getting softer and almost chewy the longer I sucked on it. I am in love with the Lemon Citrus as it reminds me of warm tea with lemon. It had a very refreshing and soothing flavor. I love the fact that these come in such cute little to go puck containers so I don't have to worry about finding a year old cough drop stuck to the bottom of my purse anymore. Plus, now I can stick a puck in my coat pockets, in my purse, in the car, or anywhere I can think of to make sure I am never without. Recommendation: I didn't think these were strong enough to help with a severe cough or sore throat. They are very mild and soothing but if you are like me, I want something which numbs my throat. The nice thing is they are not too expensive and they are more like candy tasting for the kids so I can give them to them without dealing with the "I don't like it". 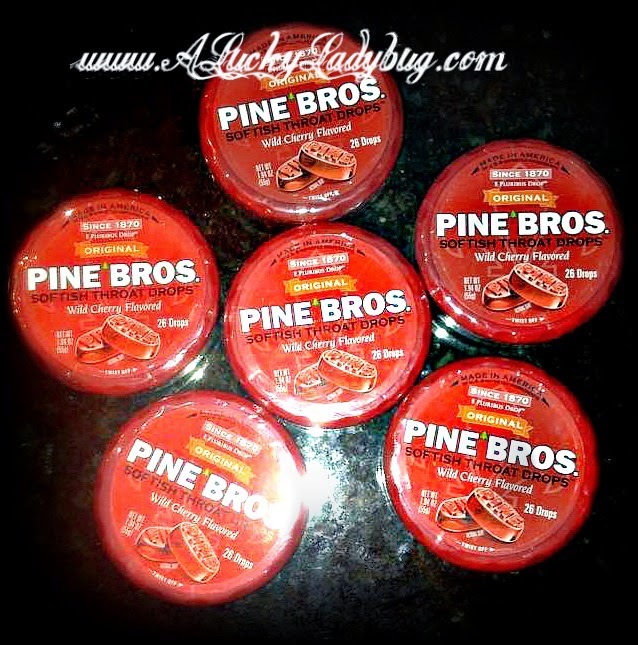 Giveaway: Pine Bros is going to give one of A Lucky Ladybug's lucky readers a 12 piece case (flavor of your choice) of their own to try! I always seem to get sick in the late fall it seems. Sometimes my colds will last for up to eight weeks, not much fun at all! I've never heard of this brand before but my youngest daughter is always got a cold so this may be something I look into to! My family almost always get sick in the Winter and we buy cold meds often. The natural meds seem to work better but they cost more and we can't always afford them but we do our best. I usually get sick when the weather is chilly and I am under the warm covers breathing the cold night air. it gets me every time! Usually our worst time of year is the end of winter, going into Spring when the weather starts to get warm, get cold, get warm again. I tend to get sick when the seasons are changing. First, my daughter, then me, then my son, all in the last 3 weeks. Definitely the worst time of the year. I usually get sick around the fall time. I usually just take cold meds, and try to rest as much as possible. Generally, I catch a cold when the seasons change. I find fresh ginger root tea with a dollop of honey helps to soothe my symptoms. :-) Thank you. I don't normally get sick but when I do it is usually during the change of the season - either winter to spring or summer to fall. I usually medicate with over the counter medications and try to sleep it off the best I can. I usually get sick around the holidays because of the stress. I take Nyquil. I had the flu for Christmas. Tylenol and Motrin for the fever. I do believe in salt water gargles for sore throat, they work. I always get sick this time of year, I am sick now. I take a mix of cold medicine and diffuse essential oils depending on symptoms. Usually in winter. Like right now. I use cough drop to get through it. I usually get sick around weather changes. In our home we wash our hands often, and take vitamin C! I and my family usually get sick in February. Like clockwork. My best remedy...hm...tea with honey, cough drops, and rest. OH! And breathe-right strips. I don't get sick very often, but when I do it is usually around the change of a season, like in October or in April/May. My best advice is to get rest, drink a lot of water, and take Airborne to ward off colds. I can get sick anytime, due to my weaker immune system, because of my FVL, the meds I take, etc. I usually get sick in February and March. I increase my Vitamin C and make sure I get enough sleep. I usually get sick in the summer. The best remedy is sleep. Well, I have lots of allergies and breathing issues, so it's pretty expected that I'll be sick at least at the beginning of each season. I recently quit immunizations, but they seemed to really help, although the last injection the gal accidentally gave me too much and I had to be rushed for help! My grandfather's cure: Boil one cup molasses with one fourth cup vinegar until syrup coats spoon (13-15 minutes, stirring only after it starts boiling), take off heat and add 1 small onion, finely diced. Pour mixture into a chilled buttered pan. Victim- (Me) was required to consume all of it. The "cure" worked: The only time I ever stayed home was when I was REALLY sick. I generally don't get sick, however I remember having a slight cold in November. I drank a lot of tea and felt better a few days later. Since we moved to Florida, I don't really get sick anymore. I'm homebound so I seldom get colds, however I got one in November after a doctor appointment. I tend to get sick in the dead of winter. Seems odd to me that a virus can live in the below freezing temperatures. I was just sick a couple weeks ago, and it was brutal. I am not a good patient. I usually get a cold or sinus infection in the winter time. I use a vaporizer and sweat it out. I tend to get sick when the weather is changing from winter to spring. My best remedy is rest! I usually get sick toward the spring season when the weather starts to change. I gargle with salt water and take zinc to slow down the germs. Looking forward to winning these awesome throat medicine. I rarely get sick. Sometimes the holidays bring you around crowds that can cause illness. My family seems to always be sick during the holidays. We got a letter fro our first grade teacher saying your child was exposed to Scarlett Fever and two days later my granddaughter has it. They seem to pick up everything at school. I usually tend to get those summer colds. I usually just ride through it unless I get a sore throat and will use lozenges. I usually get sick in the winter, like January or February. For me, drink lots of water, some OJ, eat chicken noodle soup, and get lots of rest. Treat symptoms when needed (headaches, cough, etc.). I usually get some type of virus from my kids in the fall. I take lots of vitamin C, aloe vera juice, and zinc along with over the counter cold remedies for relief. My best remedy for a cold is to drink a lot of water and rest! Hot showers, vaporizer, cough drops are my best defense for a cold. I don't get sick very often, but when I do it's usually a cold during the winter months. I like to keep warm, drink plenty of water, hot tea with lemon and honey, and eat lots of chicken soup. Thanks. I usually get sick in the fall when the weather changes. My best remedy is a humidifier. 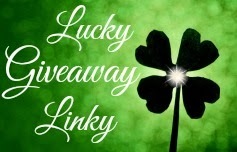 Something I love love love about your blog is all the giveaways!! It is rare for me to become ill. I usually get sick in the Winter and again in the Summer. We all just got over terrible colds in our house. We take cough medicine to make it better. Mostly it just takes the 7-10 days to get better. I usually get sick during summer. I'm actually sick right now. The first thing I do when I get sick is reach for the Nyquil and humidifier. I also like to use Vicks Rub and gargle with a lot of warm salt water. I tend to get sick when the seasons/weather is changing. I usually get sick in March. I drink lots of hot tea & fluids! I normally get sick in the winter time, My best remedy for a cold is Tea & Honey! I usually get a cold the end of winter beginning of spring. My son gets sick a lot. I usually make him drink lots of water and gargle with salt water if he gets a sore throat. When I'm sick, I like to make homemade chicken soup. I haven't been sick lately because I make soup chicken often. I get sick in the winter, broncitis, sinus infection and sore throat. Then again in the spring with allergies. I usually get sick in the winter. Drink lots of liquids and get lots of rest to feel better. I get colds all year long, but more often in the winter. I think sleeping more helps to recover faster. I usually get sick about once a year in the winter sometime, usually feel it before bedtime. I use lozenges or OTC remedies or a hot toddy. 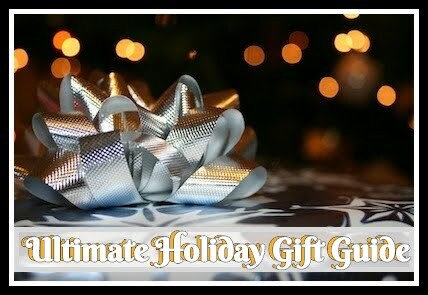 Thank You for the giveaway… December thru March are my usual "URI" months; usually just take OTC cold medicine to relieve symptoms, drink plenty of fluids, and use a Neti pot a few times each day ! I don't really get that many colds but they're usually in the winter months when I do. Usually use the usual OTC & supplements. Currently just getting ailments in other areas LOL.